Top of the afternoon to ya! 🙂 I just finished making up a batch of these delicious little nibbles. 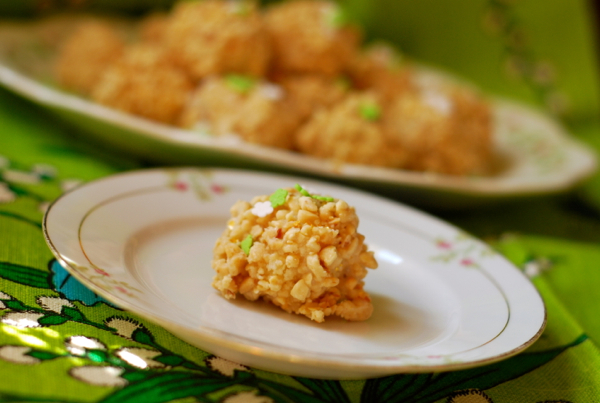 They’re adorable, easy to make and they sort of taste like salted nut roll cake bites. My kind of St. Patrick’s Day dessert! 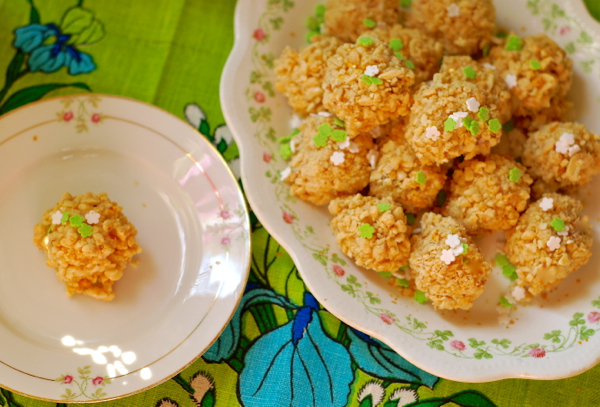 I make LOTS of stuff for our St. Paddy’s day gatherings, so I like to keep each part of the meal simple. You can use homemade or store bought pound cake for this. I like to use the already sliced Sara Lee pound cake when I’m in a hurry. Each slice of pound cake will yield 8 Blarney Stones, so plan accordingly. Lay a long length of waxed paper on your counter top. Cut each piece of pound cake into 8 uniform cubes. Place frosting and whiskey OR milk in a bowl and whisk until smooth. Place salted peanuts in another bowl. Dip the pound cake cubes, one at a time, in the frosting. Shake off excess. Place coated cake cube in peanuts and gently coat by rolling and pressing the nuts into the cake. Place on waxed paper. Repeat with remaining cake cubes. Allow to set for an hour before transferring to an air tight container and placing in refrigerator until ready to serve. To serve: Place on a cute platter and garnish with sprinkles. Enjoy, and Happy St. Patrick’s Day to you! These look yummy! I’ll definitely be running to the liquor store this weekend! Happy St Patty’s Day friend!